For those of you who love this piece, I just released a book which expands (by 4 times the narrative and photos) the subject matter of this article. THE PONEMAH YEARS: Walking in the Footsteps of My Mother, a paperback book is available via numerous online sources including Barnes & Noble and Amazon. Locally, it can be purchased at the gift shops of the Backus Hospital and the Slater Museum in Norwich, CT. Please check out the BOOKS, EVENTS, and NEWS pages of this website for further information. Also, if you are a Facebook member, you can LIKE/follow my author page Bernice.L.Rocque.Author. I will provide updates there and also on Twitter (@UNTILtheROBIN) about book appearances. Bittersweet is the way I would describe the moment I realized how much my mother loved her weaving job at the Ponemah Mill. I didn’t learn this until late in my mother’s life. There were little clues now and then, but I didn’t see or hear them — even as a budding genealogist. When I was growing up, we drove by the giant building frequently. Yet, Mom rarely mentioned the mill, and I didn’t ask her about the time when she worked. She and I lost precious conversations we could have had. 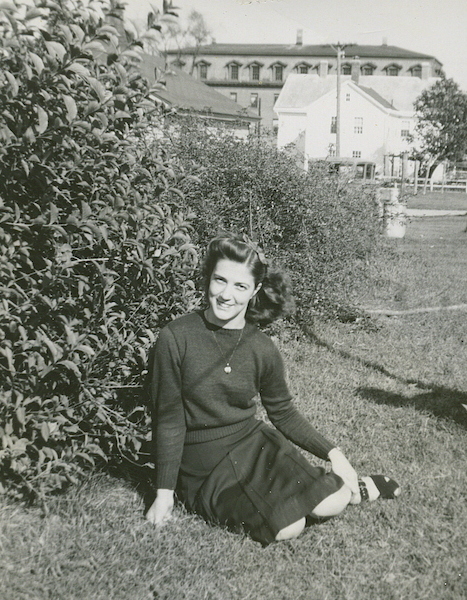 This photo of my mother Gabrielle Picard was taken in the early 1940s, in her early years as a weaver at the Ponemah Mill in Taftville, Connecticut. The Ponemah building at Providence Street and S. 2nd Avenue rises in the background. That building housed a grocery store important to those who lived in Taftville. When my dad died in 2001, Mom wanted to talk about her childhood and her life before they married. Unlike many women coming of age during WWII, she did not leave her job once she married, or even a year later when my dad returned from wartime service in the Marines. Dad was a practical man! Why should she leave her job if she wanted to work? To them, it didn’t matter what other people were doing — a sentiment drilled into us when my sisters and I were young. My parents’ goal was to build a house that was mortgage free. Her income bought the lumber and other materials. Dad supplied the labor. Mom’s job at the mill began purely as a monetary decision by her father, much like the decision her parents made to leave their dairy farm in Canada. The farm’s income was not enough to support their large family, so they emigrated to the United States for the fair wages and steady work offered by the famous Ponemah Mill. Like many families of the time, my mother and her siblings would go to work early in their lives. My mother was four-years-old when her family took “the long train ride” from Montreal to Connecticut. They entered the U.S. in Vermont in May 1924. 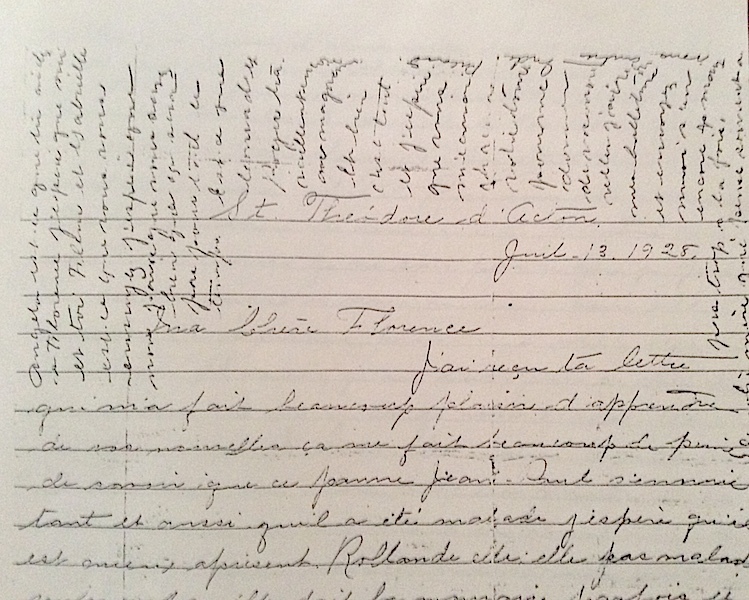 My grandmother, Eugenie, had convinced her husband Alphonse Picard to come to the United States and specifically to Taftville, the location of the Ponemah Mill. Actually, my grandmother Eugenie Duhamel was born in the United States in Slatersville, Rhode Island, to French-Canadian parents. Samuel Slater had revolutionized the production of cotton textiles in the U.S. and applied it in New England’s earliest fabric mills in the Blackstone River Valley in Massachusetts and in Rhode Island, where Eugenie’s father Louis worked. My great-grandparents would return to Canada when my grandmother Eugenie was thirteen. In 1894, they combined a retirement decision with a move intended to control their youngest daughter. To Eugenie’s surprise, her parents carried out their threat to send her to a convent school in Canada in order to separate her and a young man with whom she was smitten! About 1900, my grandmother Eugenie got to know Alphonse Picard while she was a novitiate at the Acton Vale convent. How their paths crossed on a regular basis is unclear, but my working theory is that his family farm delivered dairy products to the convent. The family history is that he begged her, again and again, to marry him instead of becoming a nun. She finally accepted his proposal, despite objections from her upper middle class family. They found him unsuitable, probably because as one of the youngest, Alphonse would not inherit his family’s farm. Alphonse’s father, Prudent Picard, considered a “pioneer” in local history texts, left the Quebec City area in the 1850s and became one of the founding fathers of St. Theodore d’Acton, a small town outside Montreal. His French ancestor, Philip Destroismaisons dit Picard, arrived in Canada in the early 1600s. Married in 1902, my grandparents Alphonse and Eugenie lived the dairy farming life of his family, while welcoming a new child every year or two. 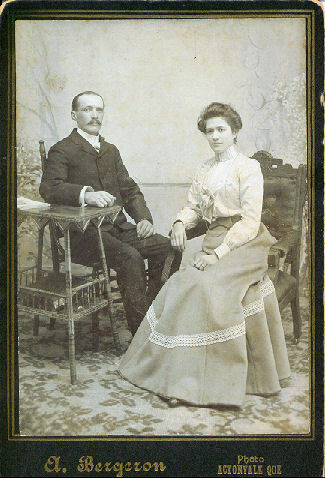 This photo on the left may be their engagement photo, but if not, was likely taken 1900-1910. The family photo was taken around 1926. 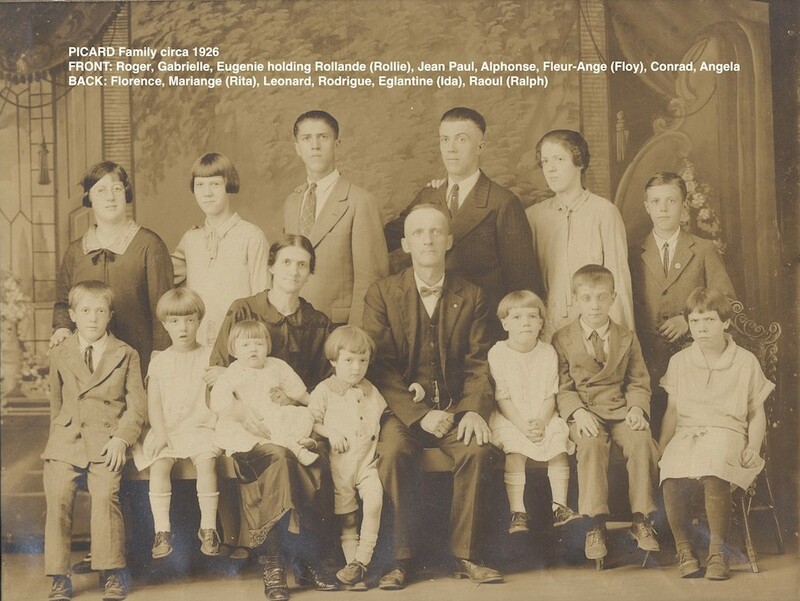 Twelve of their children, including my mother (front row, second from the left) were born in Canada. The youngest child, Rollande, in my grandmother’s arms, was born in 1925 in the United States. At this writing, Aunt Rollie is the only family member still living. 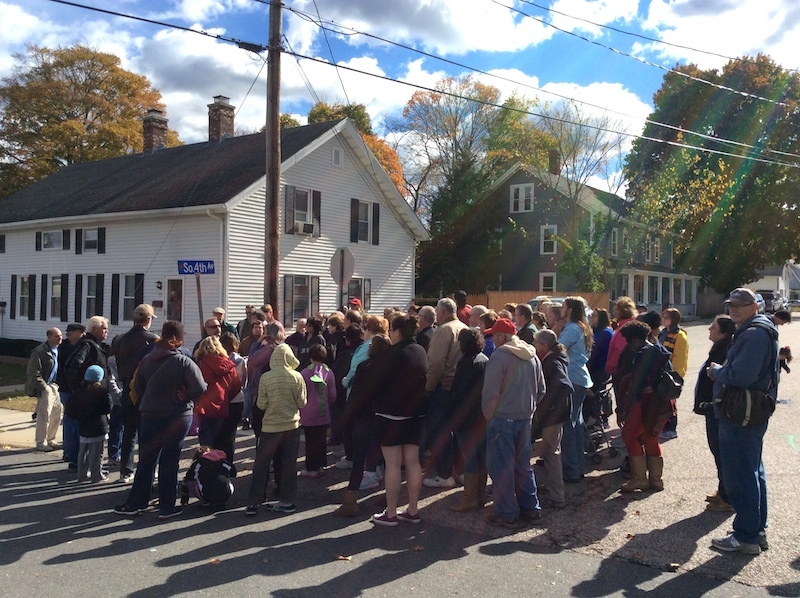 WALKTOBER, a fabulous series of walking tours in eastern Connecticut sponsored by The Last Green Valley, have occurred in the Fall for many years. The tours take in all sorts of historical and cultural subjects. A Ponemah Mill walk is usually offered. If you are unfamiliar with WALKTOBER, click here for their 2014 program. In 2004, Mom and I took the Ponemah walk, led by Rene Dugas. In 2004, my mother was 84-years-old and Rene was 90-something. Four generations of the Dugas family operated a photography studio in Taftville. Rene said everybody knew everybody in Taftville. Even though a half-century had passed since she lived there, Mom looked at me and smiled as she repeatedly pointed to people she recognized in the photos Rene circulated in the first part of the tour. We walked the Taftville streets and then around the Mill’s exterior, Rene lending his unique blend of history and humor about life in the village where almost all the residents worked for Ponemah. Rene noted the mill was always hiring. He joked that he had been fired and rehired numerous times. 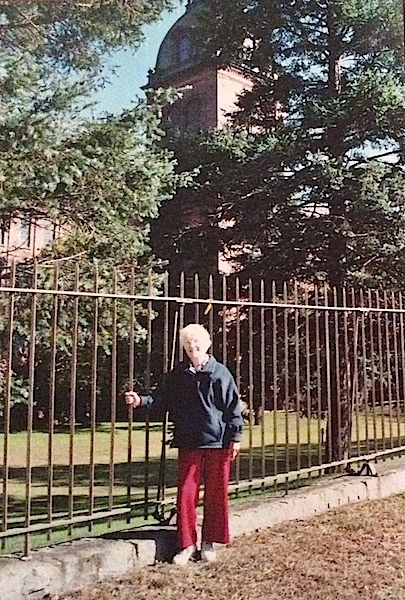 My mother posed in front of Ponemah’s Building #1, the main building, where she worked on the fourth floor as a weaver sixty years earlier. Mom and I turned off the tour briefly onto South A Street. 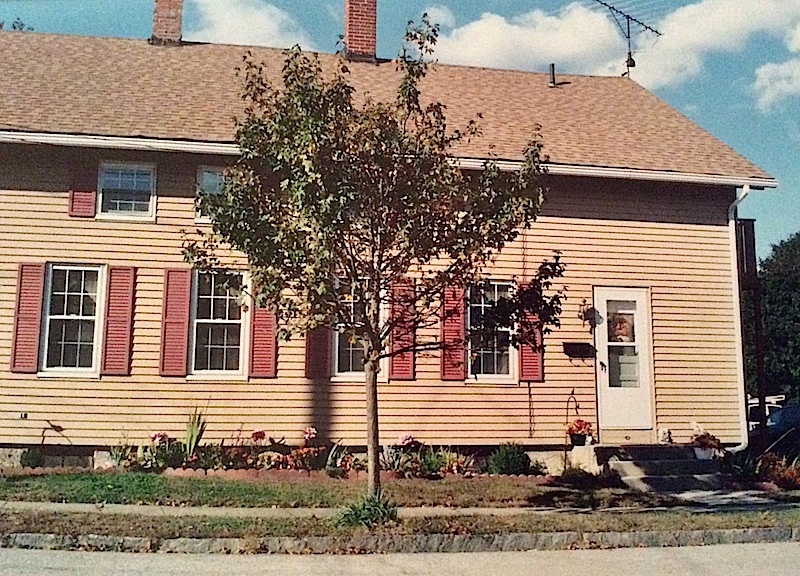 Mom spotted the house where she grew up right away, despite its updated appearance. In Mom’s youth, the village consisted of neat, look-alike white houses. Her family rented the right side of this duplex with its four bedrooms. When my sister and I complained about having to share a double bed, my mother would remind us that her family of thirteen children slept four to a bed when she was young! That memory made me smile as I arrived in Taftville for the WALKTOBER tour on October 26, 2014. 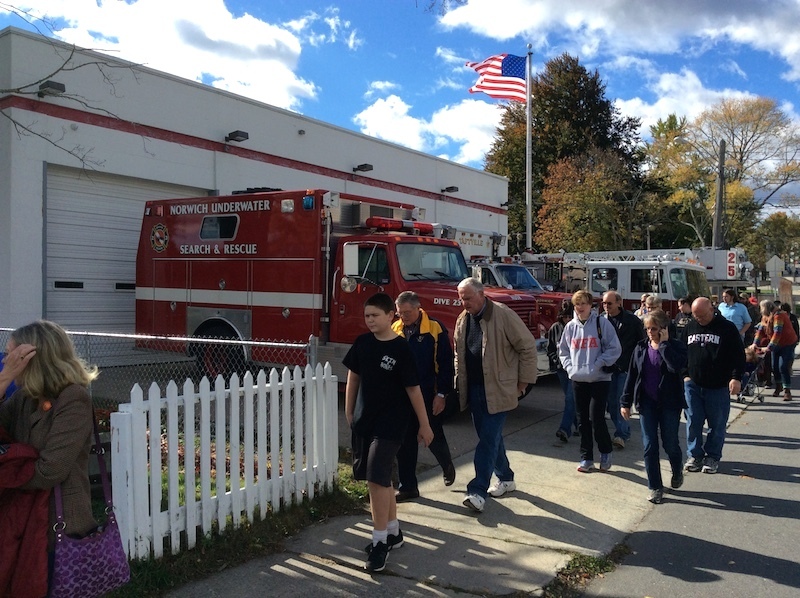 A good-sized crowd was assembling at the Taftville Fire Station. While we waited for the tour to begin, a slide show ran inside the firehouse, with a wide array of images representing Taftville’s history. Inside the Taftville Fire Station, Fire Chief Tim Jencks gave an introduction and then we headed down Providence Street toward the Ponemah Mill. Pausing at North 3rd Avenue, Tim provided some Taftville history, including selected events from Taftville’s fire protection and incident history. I was not aware of the disastrous 1915 fire in the village, nor the one at the Sacred Heart Convent School in 1927. Since my mother was born in 1920, the latter provides a possible explanation about why my mother started school at second grade level, rather than first. 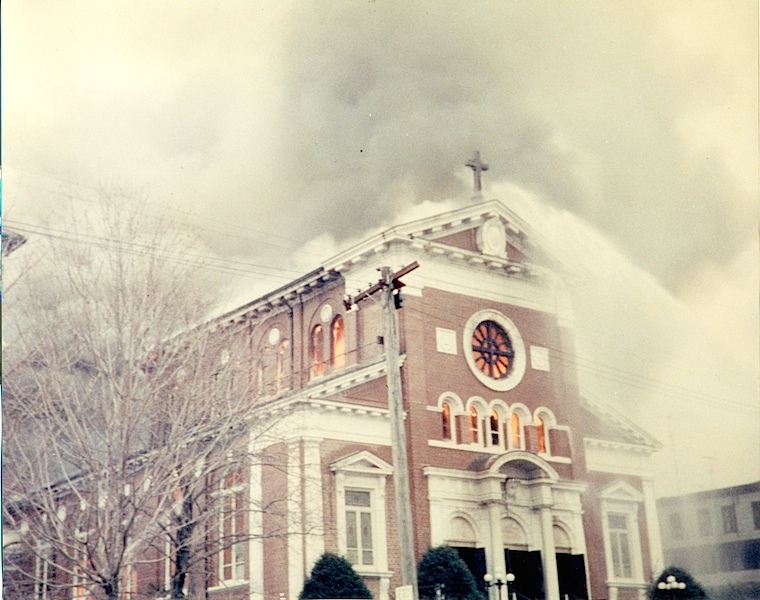 A major fire in April 1956 consumed much of Taftville’s Sacred Heart Church. These two fire photos are courtesy of Fire Chief Jencks. 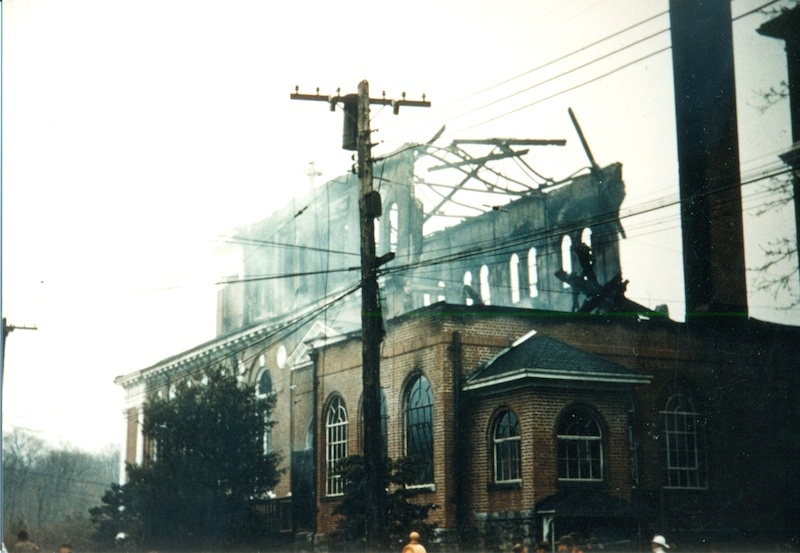 The second photo, with a view from the rear of the church, displays the extensive fire damage to Sacred Heart Church. The firefighters were somewhat constrained in battling this fire. They did not want to break the stained glass windows. 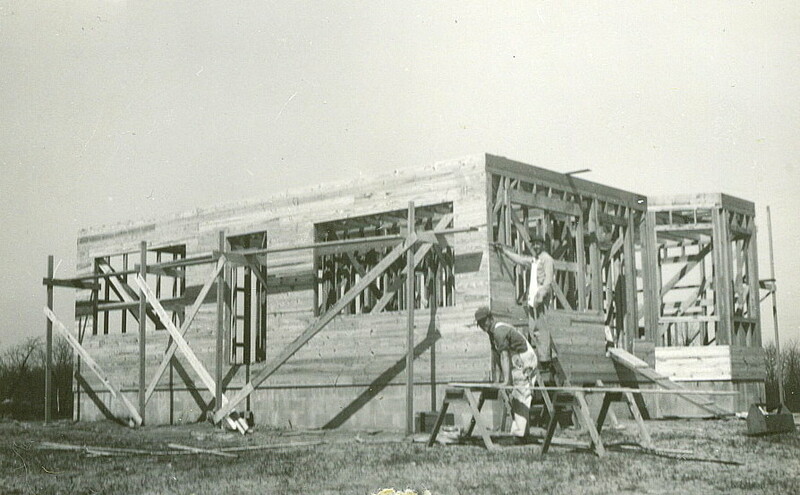 My dad was part of the construction crew which rebuilt this church where my parents were married in 1945. Ironically, I have a happy memory associated with the aftermath of the fire. Picard cousins of mine lived right on Providence Street when I was growing up. So, during one visit, my cousin Susie and I walked up the street to see the repair activity and say hello to Dad. We stood across the street on the sidewalk, but couldn’t see him at all. So, we yelled and yelled until my father came to the edge of the building, near the top. All the men were smiling down at us, two little kids about six and seven at the time, carrying on a loud conversation with my dad. That memory still plays like a film in my mind. 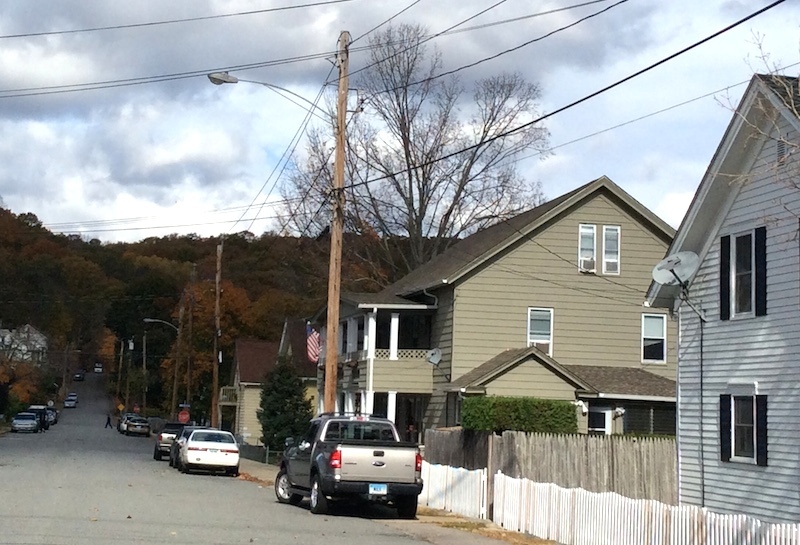 While at the intersection of North 3rd Avenue and Providence Street, Tim Jencks pointed out that if you look north up North 3rd Avenue, the view of this photo, and veer right at the end of the street, you would arrive at the location where Ponemah’s executives used to reside. The proximity was convenient for their work and near the Taftville Congregational Church, the “green church” across from the northwest corner of Ponemah Building #1. Ponemah donated the land and the green paint to the church’s founders. 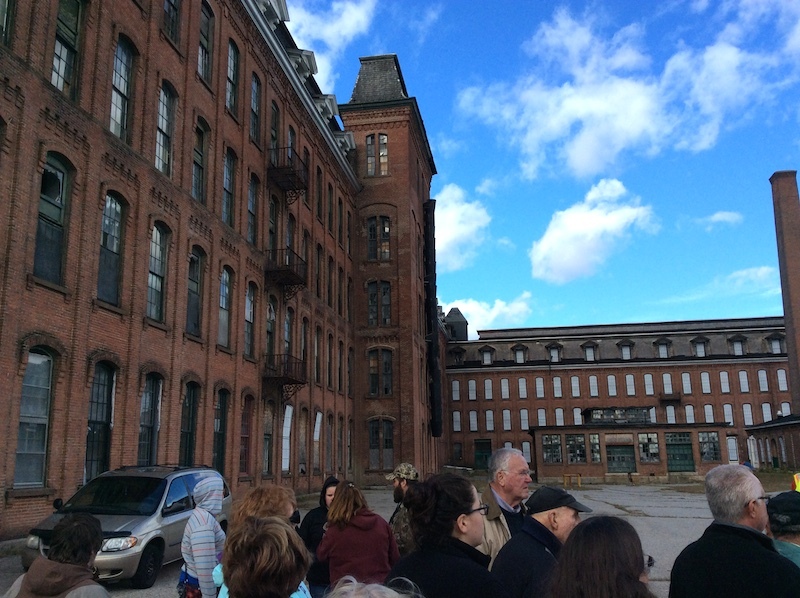 Our walking tour continued down Providence Street. 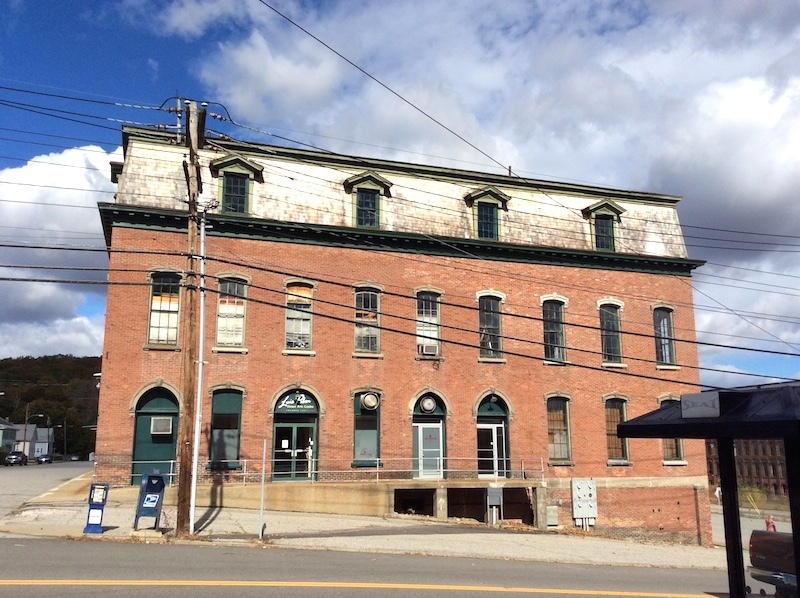 This Ponemah building, directly across the street from the Mill’s Main Building, housed two services important to Mill employees: the company store and the medical office. Across the street was the grocery store. My mother worked the first shift at Ponemah. On her walk home after work, she often stopped to pick up food items for the family’s evening meal. Undoubtedly, my organized mother was already thinking about the household chores that she would manage that evening. My grandmother Eugenie died when my mother was ten. She had wanted her children to attend and complete high school. At one point, Eugenie also expressed her desire to work at the Mill to her husband, Alphonse. He didn’t support her in either of her wishes. When she died in 1929, those dreams for her children and for herself died with her. 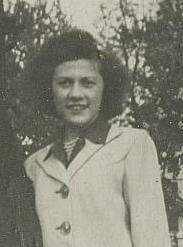 Mom remembered her mother Eugenie as a gentle and soft spoken woman. When I translated a letter my grandmother had written home during her visit to Canada in 1928, I discovered Eugenie could be quite funny. My grandmother Eugenie, in a light-hearted narrative, relayed the story about how my Aunt Rollie, three at the time, had wandered into another room, found a pair of scissors and cut off much of her own hair! The Canadian relatives were not amused, unlike my grandmother. After their mother died prematurely in 1930, Mom’s older sister, Florence, managed the large household until she married in 1938. 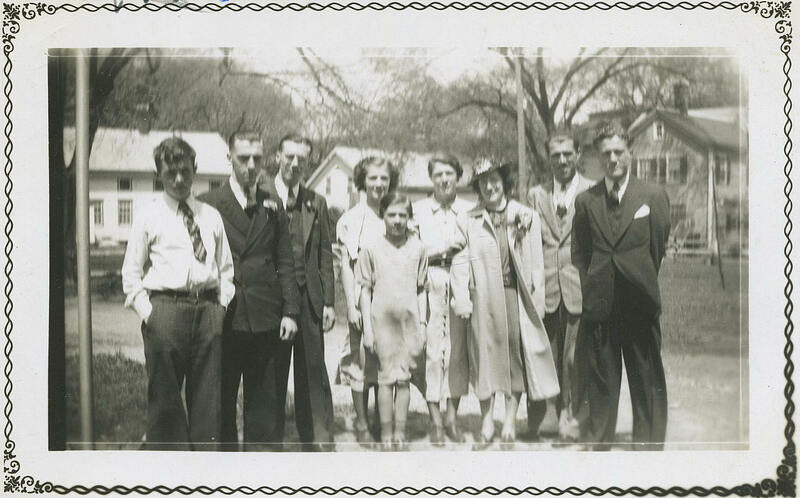 Photo: Picard family in Taftville at 1938 wedding of Florence to Maurice Provencher. From left: Jean Paul, Conrad, Ralph, Gabrielle (my mother), Rollie, Ida, Florence (the bride, with hat)), Leonard, Roger. At age eighteen, my mother assumed this responsibility. At least eight family members still lived at home. My grandfather Alphonse expected a fresh soup before their supper “every evening” — Mom once told me. She also noted that the men in the family tended to return home from their jobs, sit down, and relax with a smoke or tobacco chew while they waited for dinner to be ready. After dinner the men often went out. The female members of the household bustled about completing the myriad of housekeeping chores waiting for them before and after the evening meal. The vital statistics would later reveal that, collectively, my mother and her sisters outlived their brothers — by an average of fifteen years. 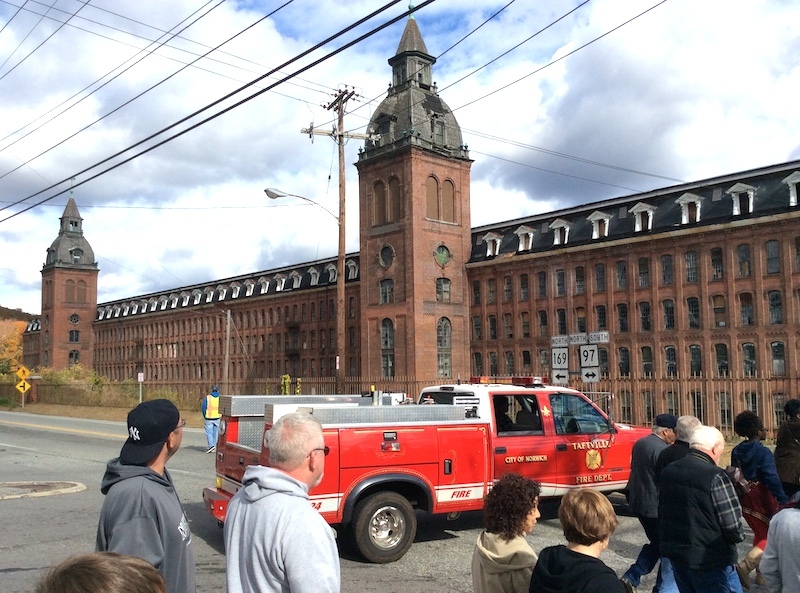 Fire Chief Tim Jencks told us that the Mill provided medical services free to its employees. If the medical problem could not be handled by the doctor in Taftville, the employee was sent to Backus Hospital where Ponemah payed for two beds. Well — her boss arranged for her to have her eyes tested! It wasn’t long before she was wearing glasses and could see the imperfections she needed to spot. I thought it was great that the Taftville Fire Department, largely volunteer, escorted our group and ensured safe walking conditions here and later in the Mill. 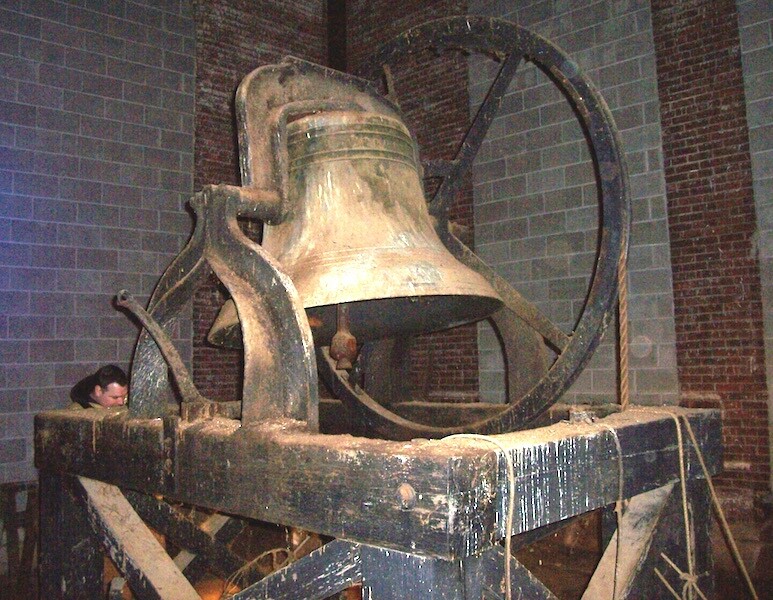 The south tower on the right, closest to the fire vehicle, still holds the famous Ponemah Mill bell. 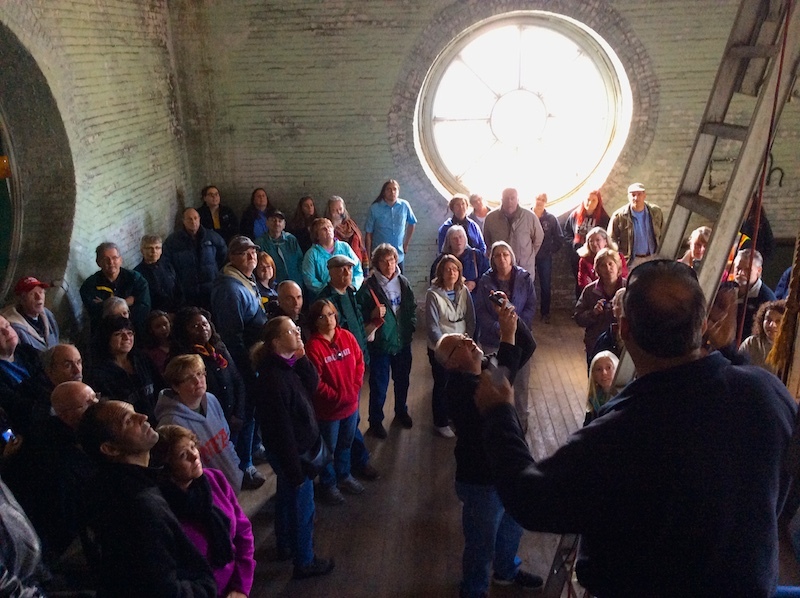 Fire Chief Tim Jencks reminded our walking tour that this tower was damaged during hurricane Sandy. My mother said you could hear the bell from anywhere in Taftville. She recalled it ringing three times for her shift, first to let employees know that if they weren’t already awake, they needed to get out of bed; second, if they weren’t on their way, they needed to “put a wiggle” in it. The third bell signaled the start of the shift. Fire Chief Tim Jencks indicated this building contained more than 50,000 panes of glass and countless bricks. The Ponemah Mill bricks were sourced from Dayville, Connecticut, a town near Danielson in the northeast corner of the state. They were transported via railroad the twenty miles to Taftville during the initial period of construction from 1867-71. Our group was now standing in the courtyard behind Ponemah Building #1, the Main Building. 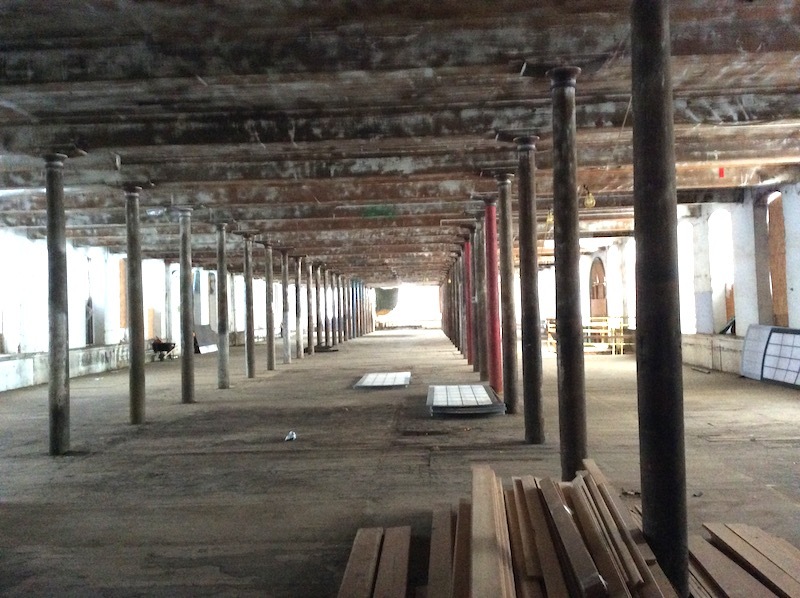 The current owner of Ponemah, a successful converter of old mills is in the process of renovating the structures on this site. Fire Chief Jencks noted that virtually every reconstruction aspect must pass through the historical commission. On the left side of this photo you can see the five floors. The weaving looms were housed on the fourth and fifth floors of the building. (The fifth floor has dormer windows.) 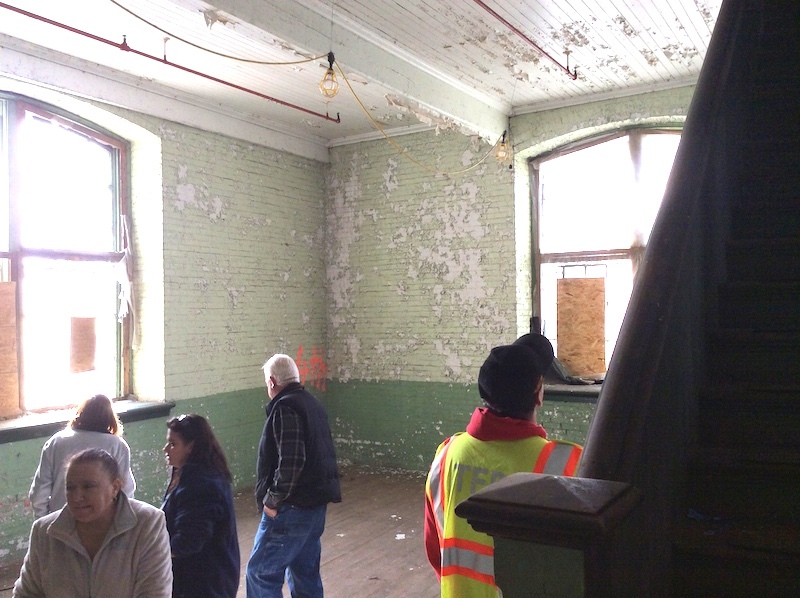 Note the original fire escapes (ladders removed) and the tower extension that contained the restrooms. 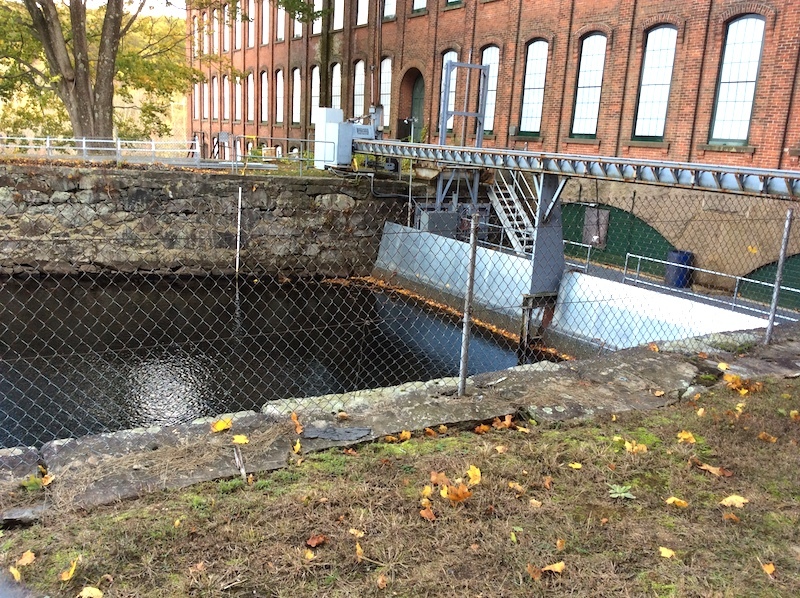 The right side of the photo shows the “L”, below which the water intake, electrical turbines, and boilers fueled the Mill’s operations. There was a circular train track extension into this courtyard, above photo. Incoming raw materials arrived and outgoing fabric products were loaded for transport. 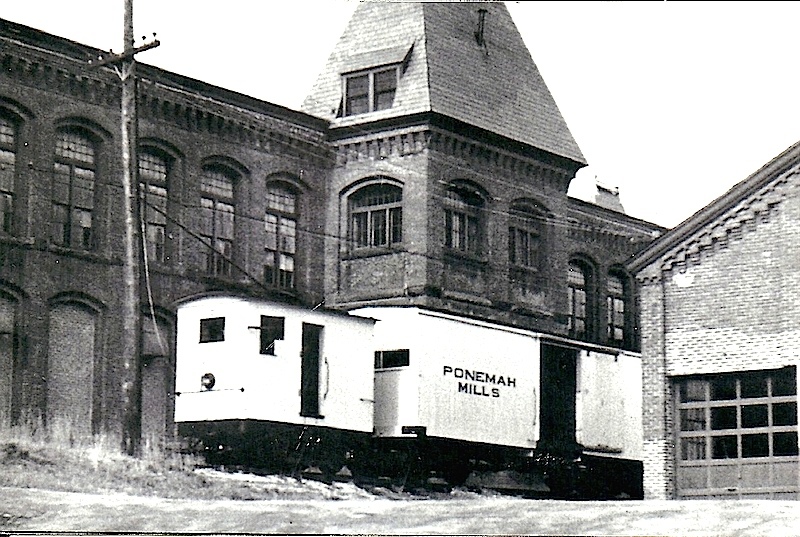 Fire Chief Jencks supplied this photo showing a train car at the rear of Ponemah #2, which was adjacent, just south of the Main Building. You can see how closely the train cars nestled in to the Ponemah buildings. Fire Chief Tim Jencks next led us into a single story building located to the right of the “L” but not visible in the photo above. This building, in the courtyard between the Main Building and the Shetucket River, housed the Ponemah Mill’s executive and administrative offices. 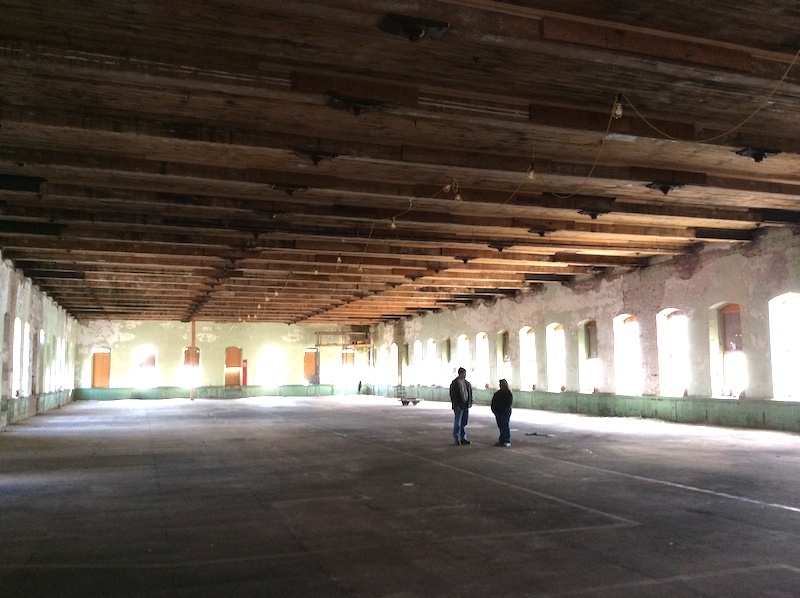 Haven’t the interior renovations brought back the beauty of this grand old building? I truly wish I could travel back in time and see the Ponemah Mill in its heyday! 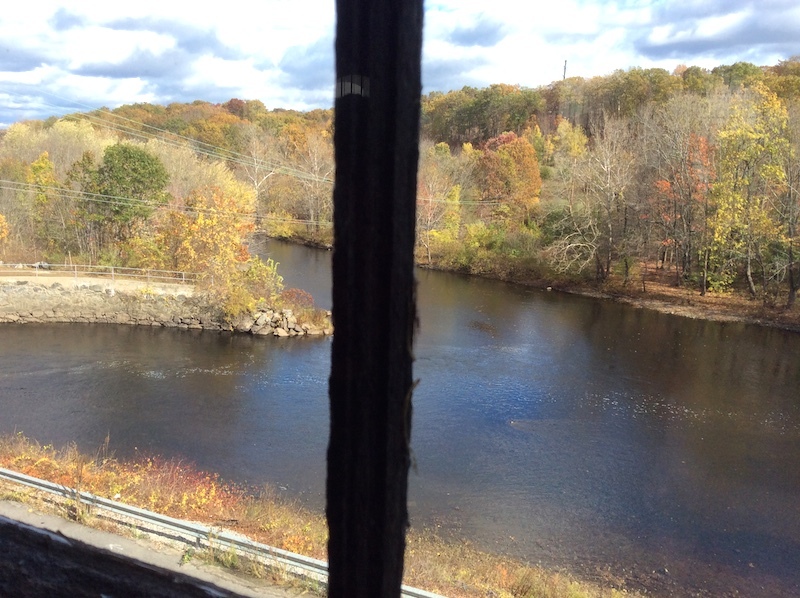 When I stepped over toward the large windows on the east side of this administration building, my reward was this panoramic view of the fall foliage along the Shetucket River. From here, one could easily see the railroad tracks and the close proximity to the river — the source of electricity for the Mill’s operations. 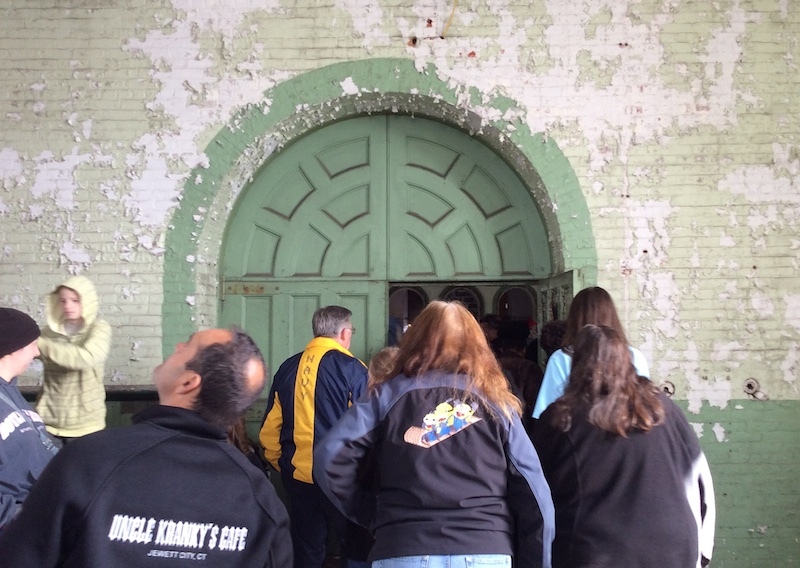 Our group’s next stop was the “L” between the main and administration buildings. This room was part of the vertical corridor in which the river water entered the building and was transformed into electricity two floors below. 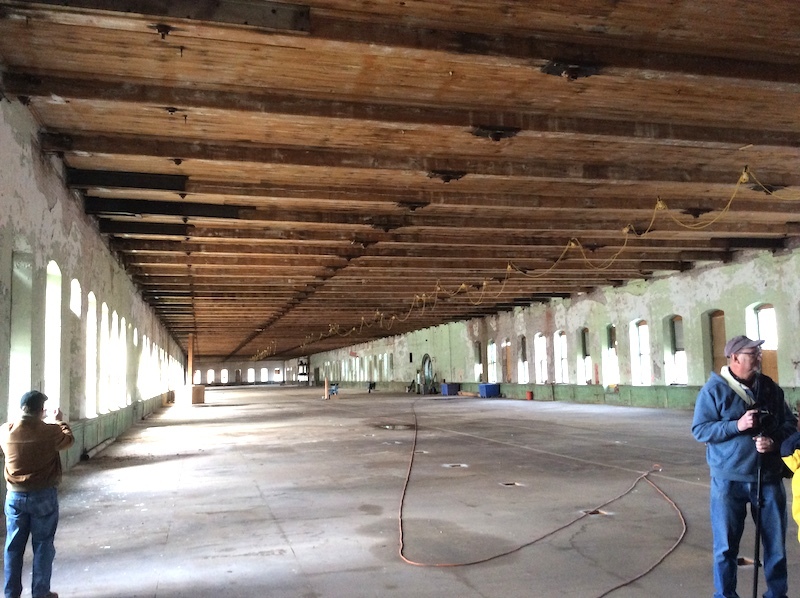 The Mill’s giant turbines and coal-fed boiler operations were all housed in this general area. It is easier to imagine if you view this photo below taken later when we walked out behind the Mill. The final part of the tour took us into Ponemah Building #1, the large main building where my mother worked during the period 1937 to 1950. I was so anxious to see the inside space of Ponemah Building #1. Immense space, as we soon discovered. 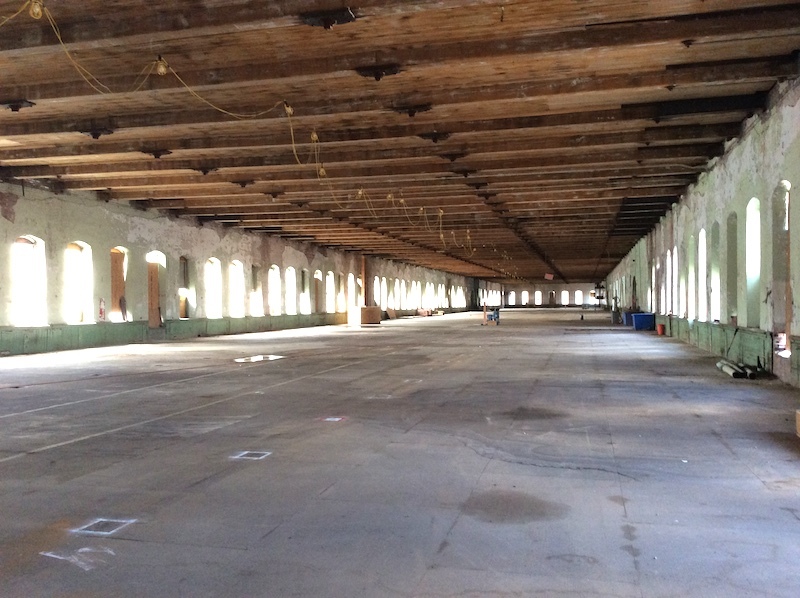 The floors measure about 750 X 75 feet. All sorts of preparation occurred on the first three floors of this main building, from carding the cotton, to spinning the thread, to loading the bobbins for the army of looms upstairs. The fourth and fifth floors were absent the columns of the first three floors, for ease of loom placement and operation. 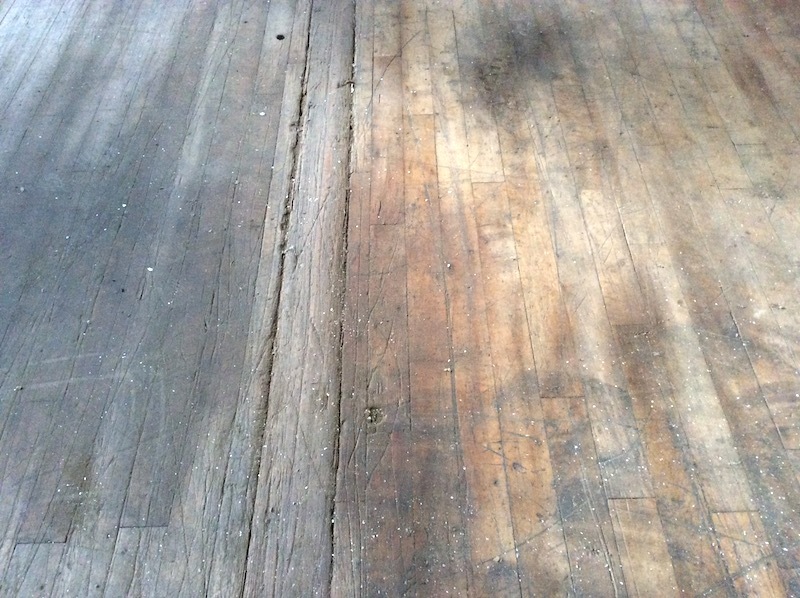 The firm converting the Mill left a section of original mill flooring intact on the first floor. I wonder how many generations of Taftville residents walked across these boards just inside the rear south tower entrance? It was time to climb the stairs of Ponemah Building #1. Remember the two towers that you could see in the front view of the Main Building? The towers housed the staircases, accessible from front and rear entrances. Imagine the employee traffic these twin staircases carried between the first and second floors at the start and end of each shift! Many of us climbing the staircases during this tour were walking in the footsteps of our parents, grandparents, etc. Columns brace the first three floors. 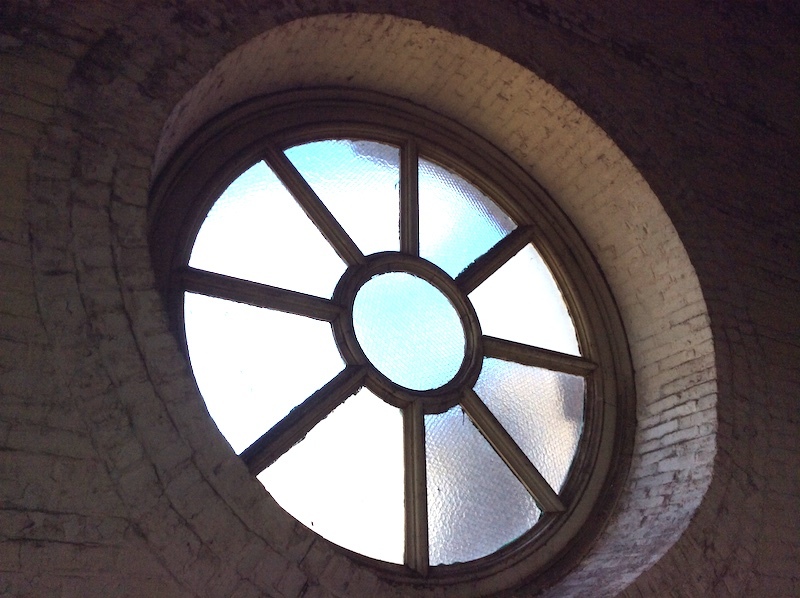 This photo was taken on the third floor of Ponemah Mill’s Building #1, along with this shot below which represents one of the most interesting things I learned on this walking tour. 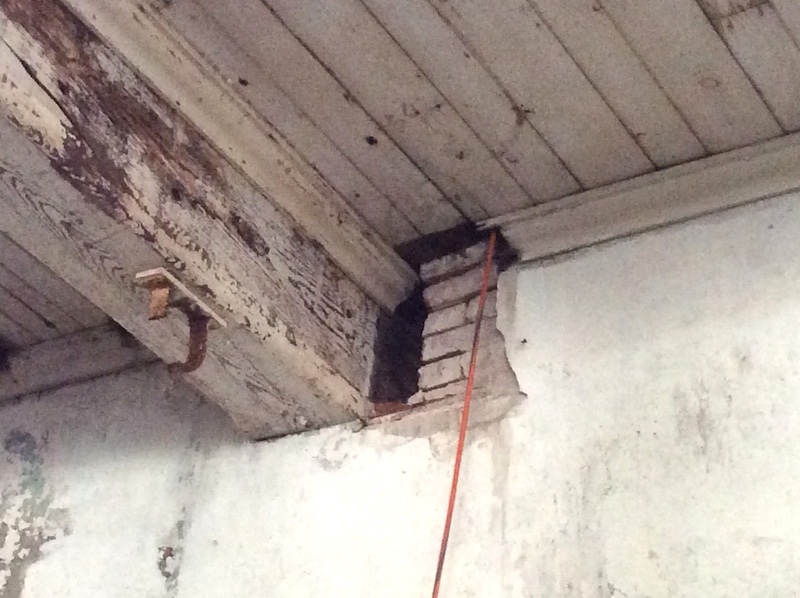 Notice the construction groove where this support beam rests. Fire Chief Tim Jencks mentioned that the owners of the Mill understood they had reduced the risk of fire in this mill by constructing it largely of brick. 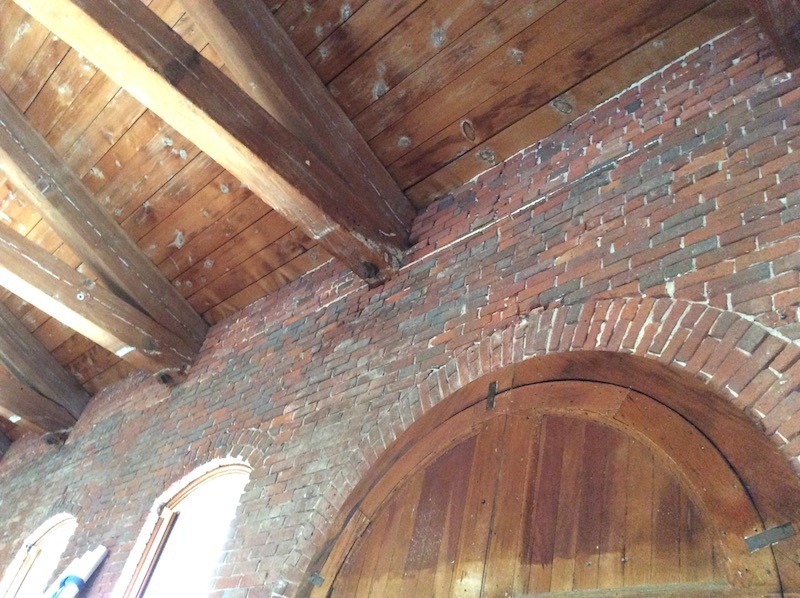 They also knew there was enough wood in the ceiling supports, floors, staircases, and wood trim, as well as the raw materials, finished fabric, etc. to feed any fire that got started. So, if ever the Mill was damaged by fire, this design would facilitate quick replacement of all the main support beams. We were now climbing the stairs to the fourth floor, where my mother worked as a weaver. 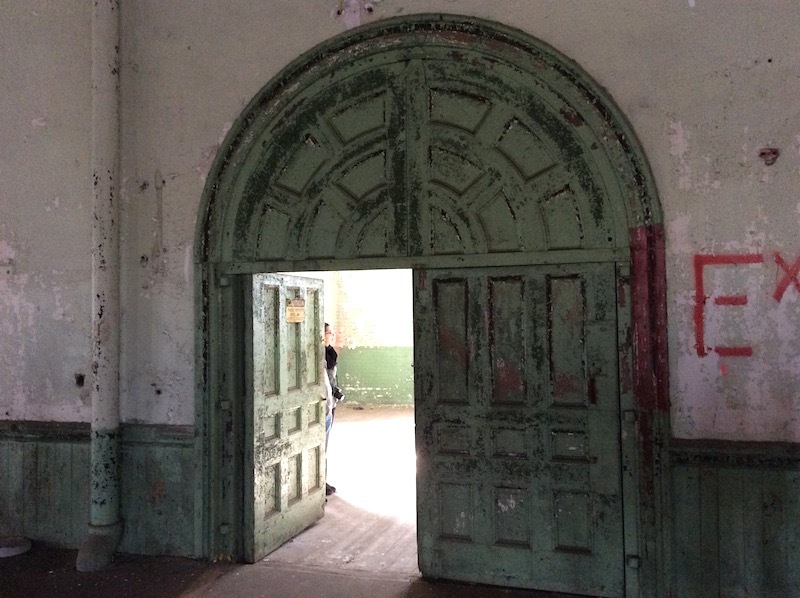 I held back at first… and then passed through the 4th floor doorway, a wave of exhilaration coursing through me. Once inside, I was mesmerized by the size of the space. I looked right and left — and then right and left again. But, the floor was nearly empty. I closed my eyes, trying to imagine the sea of looms that once clattered in this space. It was so quiet now. So, a few days after the Ponemah walk I called my Aunt Rollie to learn what she could recall from her 1940s work experience. My Aunt Rollie, five years younger than my mother, was employed by Ponemah, too. She went to work there in 1942 when she was seventeen, starting as a battery hand, like my mother had done years earlier. Battery hands did lots of running — bringing the refilled giant bobbins to the weaving floors many times each day. Aunt Rollie said that my mother’s looms were located right outside the office of Mom’s boss, Mr. McKeon. In checking the 1940 U.S. Census data, I believe this was James J. McKeon, who was an assistant foreman at a cotton textile mill. He was forty years old and lived on Occum Road with his wife, Alice, and sons Robert, Roland, and Gerald. My aunt explained that ‘Jimmy’ McKeon liked being able to check on my mother easily. Mom was a high volume producer with a low defect rate. Mr. McKeon wanted to keep her looms humming. My mother’s “essence” became clearer from hearing Aunt Rollie’s recollections. Beyond the joyful nature of these conversations with Aunt Rollie (and others like Aunt Pauline who elaborated recently on life in the village), I am still fascinated by the endless nature of the memory reservoir, much like the hidden spring deep beneath my parents’ 33-foot well that never ran dry. Tapping one person’s reservoir opens a stream of memories in both people, during conversations and also days or weeks later. As I write this, I am recalling now a particular visit to my parents’ in the 1990s. I wanted to use my mother’s sewing machine to repair a garment. All her bobbins contained thread. Neither of the two with the closest color match contained enough thread for my repair. My mother became quiet… I watched her cross the two ends of the bobbins’ threads on her index finger. Then, in a quick, circular swishing motion with her thumb pressed against the thread cross sitting on her index finger, she created the tiniest knot I have ever seen. She looked at it and laughed, saying, “I am amazed I could still do that.” We spooled the thread of one bobbin over the other. While making my sewing repair, I observed the tiny knot pass right through the eye of the sewing machine’s needle! So, standing on the fourth floor of Ponemah, I was looking around and wondering. Where exactly had my mother’s looms been located? My Aunt Rollie said that Mr. McKeon’s office did not have walls. I suspect his office space consisted of a desk and a few other essentials. It would make sense not to use prime loom space for administrative purposes. Though the fourth floor landing pictured at left was an open space now, I did see an office roughed in on the staircase landing of a floor below. Was Mr. McKeon’s office located here? My mother’s loom area may have been just inside the south tower doors, small photo above, which we entered and exited during our tour. (In context, they would be beyond the right edge of this photo.) Or, her looms may have been further down the floor, just inside the north tower entry, shown in the center of this photo near the blue containers. The first U.S. mill to import Egyptian cotton, Ponemah gained its competitive edge by being the first to manufacture fine fabrics of the type previously imported from England. The fine “higher number” threads were woven to produce this high quality fabric, coveted in the marketplace. My Aunt Rollie explained that the weaving floors were kept warm. From pipes that lined the ceiling, sprinklers cast steam, “like a mist,” my aunt told me, over the areas where the Draper looms were positioned. The fine gauge cotton thread needed to be damp while the looms were weaving the fabric, otherwise the thread would break — not a good thing! With a hearty chuckle, Aunt Rollie remarked that weavers “had to be fast” at replacing the 15-20 bobbins held within the battery of each loom managed. The shuttle moved quickly, emptying each bobbin in turn. It would seem that any trip to the bathroom would be a quick one, if you were a weaver. Perhaps the mill design embedded that message as well in the minds of employees. I am unsure how many employees worked on each floor of Ponemah Building #1, but the small size of the bathrooms surprised me. There were two sets of bathrooms on each floor, so two for men and two for women. 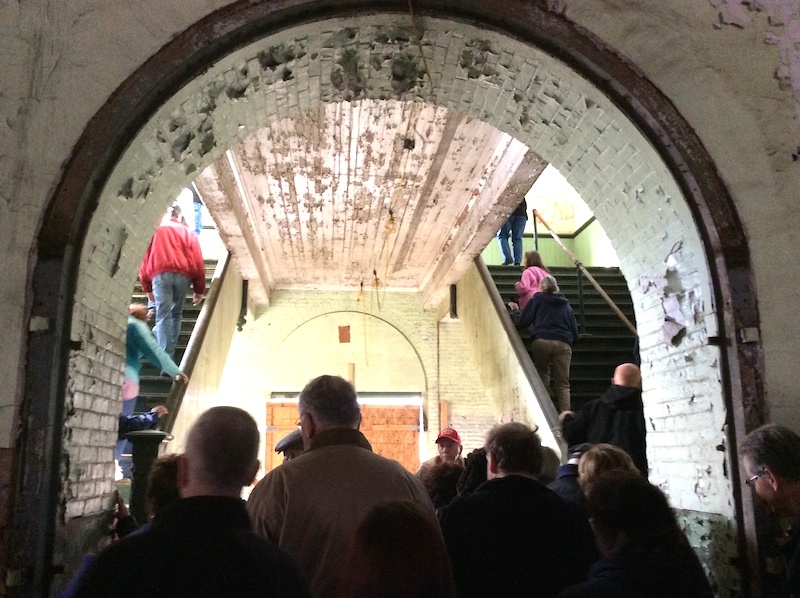 This bathroom entrance shown is directly across from the 4th floor south tower staircase we used during the tour. The men’s and women’s bathrooms seemed identical in size and design. The respective entries were open design, with no door, like facilities common in airports today. As soon as you passed under the entry arch, you were in this chamber, photo left. Since it was visible from the entry arch, this space probably housed the sinks. 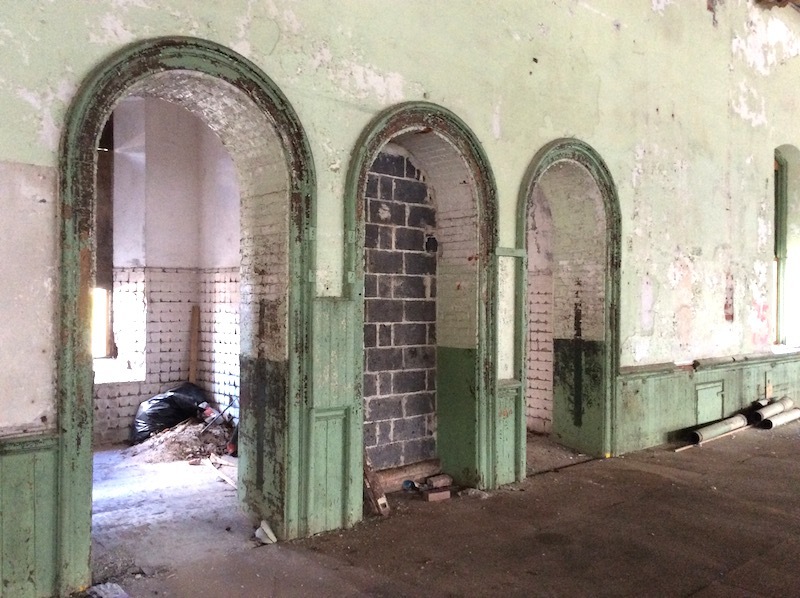 Within the right wall of this photo, not in view, is another archway, leading to an inner chamber, photo below. Since this inner chamber was not visible from the initial floor entry, this area likely contained the toilets. How many do you guess this contained? Notice that the stucco-like white finish has fallen away near the window, and may not be original to the building. 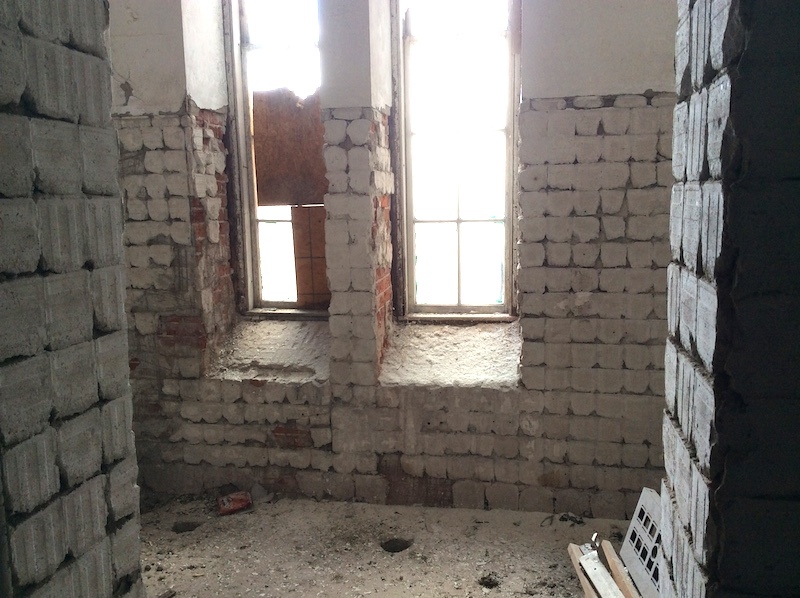 There was one more floor to see in Ponemah Building #1 — the fifth floor where the finest fabrics were woven. 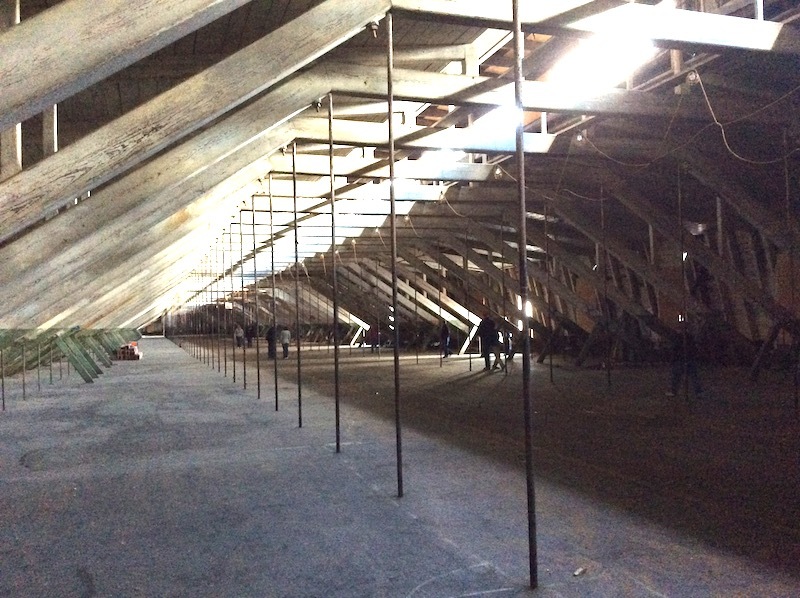 The struts and the slender steel rods (bolted downward through the fourth floor ceiling) supported BOTH the fifth and fourth floor. Unlike the lower floors, the upper two floors did not contain columns. The last stop inside the building was the fifth floor landing. …and then he invited us to ring the bell. Lots of people from the tour lined up. Young and old alike took turns and sometimes rang it together, as it took strength. We could not see it, but we could hear its melodious music. The bell sat on a platform high above us, out of view. 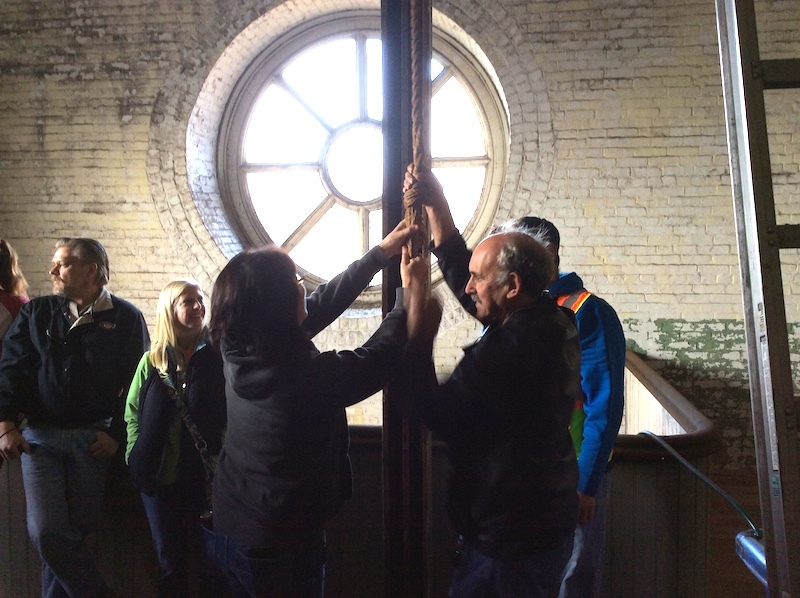 This is the bell that beckoned… my mother and relatives of many people on the Ponemah Mill tour today. Photo of the bell courtesy Fire Chief Jencks. Is it too far fetched to suggest — that perhaps the bell was clamoring to be heard once again? And, that we, equally needing to hear the sound that drew our ancestors to work so many decades ago — obliged it? 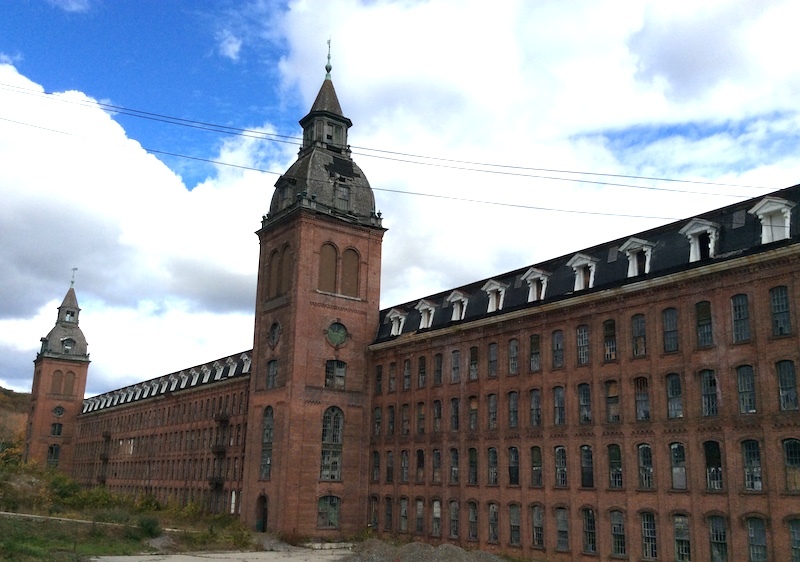 The Ponemah Mill was the largest fabric mill in the Northeast at the time it was built. Its extensive impact on many of our lives will long be felt. Much information about Ponemah exists on the internet. Take a look especially at the engineering books and articles written in the late 1800s. Also, click here to see an excellent aerial photo of the Ponemah Mill. Toward the end of her life, when my mother and I talked about her weaving work, she never mentioned how hot or noisy the mill was, though she lost part of her hearing in one ear. Instead, she told stories from her mill days, expressed how much she loved weaving all kinds of fabrics, and reflected on why she outproduced other weavers. My mother’s will was as strong as stainless steel. Clues to her perfectionist nature and competitive spirit were sprinkled throughout my childhood. She was a good softball batter, an ace croquet player, and a consistent winner in any card game. 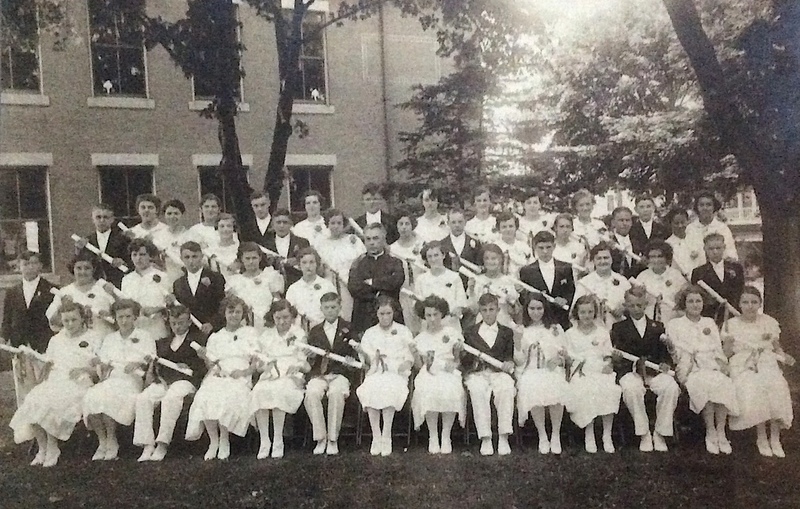 I want to share this photo of my mother’s 8th grade graduation, Class of 1935, Sacred Heart School in Taftville. My mother, Gabrielle Picard is in the top row, fifth person from the left, and next to the left tree fork. Do you recognize anyone? Like the other twelve children in her family, my mother did not attend high school. This bothered her. She would often express to us her embarrassment about this lack of education, never mentioning her weaving skill or other attributes, and ignoring my father’s comments that education and intelligence were not the same. On one occasion when she was lamenting how she felt about this perceived shortcoming, my father told my sister and I how important Mom’s income was to them in the late 1940s. 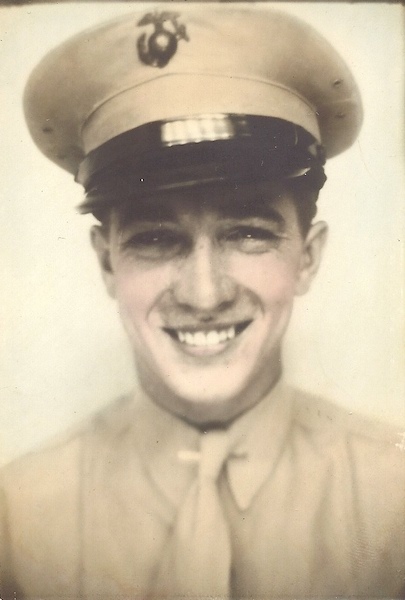 When Dad returned from WWII, he earned $30 per week as an apprentice carpenter, while Mom was typically bringing in double that amount. They lived on his income and built their house with hers. Dad looked a little sheepish while he told us this, but in both their eyes — I saw pride. For more than half my life, my image of my mother was based on my everyday experiences growing up. I saw a woman who spent her days efficiently making meals and desserts like her delicious apple pie, doing dishes and laundry, cleaning the house and running errands once she learned to drive. That’s what I thought mothers did. That is who I thought she was, even though Mom did admit she hated quite a few of these housekeeping chores! Today, I latch onto any opportunity to understand her better. I wish I had known her when she was weaving fabric at the Ponemah Mill or dancing on the excavation dirt. 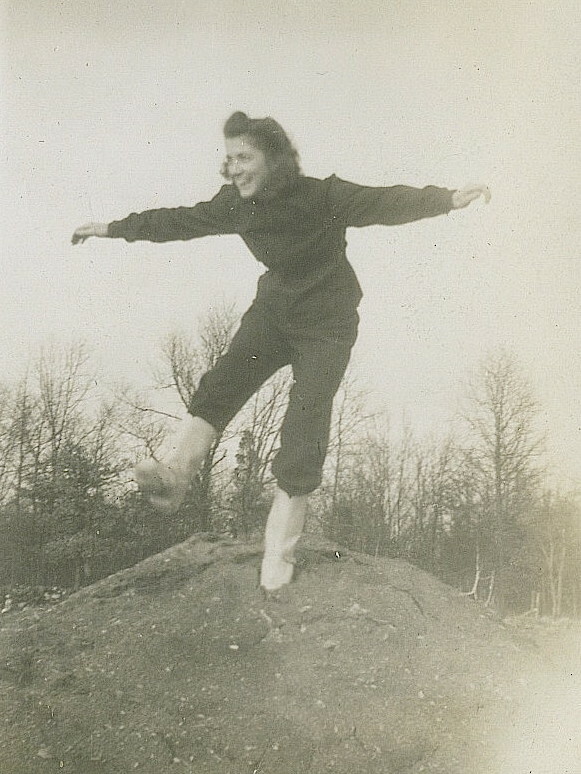 How excited she must have been in the late 1940s that earnings from the job she loved were funding the house my father was building for them. My mother’s beloved Mike (on the ladder) worked weekends and nights with his brother Tony (at the sawhorse) often assisting. In the same period of time (1947-1950), the two men also built a house for Uncle Tony and Aunt Albina. Mom told us often with a sparkle in her eyes that she had wanted four daughters and got three. She said she was grateful. Unlike many other kids we knew, my sisters and I were assigned only a few household chores, and for those we received an allowance. She also insisted on paying us for helping her with spring and fall cleaning. My mother voiced clear expectations when my sisters and I were growing up. Her job was to be a wife and mother. Our job was to go to school, learn, and get good grades. She remarked frequently that she wanted us to enjoy our childhood because hers had been cut short. “Go out and play” was a daily request from her. After Dad died, she revealed that she had wanted to return to work after I was born. Upon thinking it over, she had agreed it would be better if she stayed home and took care of me — and her future children, so she had relented to my father’s logical persuasion. I remember being stunned when she told me this. In her 81-year-old eyes there was a sort of sadness. She had left an important part of herself in that gigantic brick building in Taftville. I recognize now that Gabrielle Picard Janovicz was a woman of many talents — not just my mother. In some ways, she was a preview of the women to come — the many women who would work for the money AND for the intrinsic rewards. My mother was a weaver in her heart of hearts, but also a taskmaster, organizer, teacher, supporter, gentle medic, and sewing genie, to name a few. Her sewing passion when we were growing up reflected her love of fabric. It transferred some of her creative energy into making clothes for all the females in the family, including our dolls. In realizing this, I realized that she and I were far more similar than different. My eclectic career has gifted me lots of skills, challenges, and an ongoing sense of achievement. My mother was a good listener, but I could go on and on about my work adventures. She never tired of hearing whatever I wanted to share with her. I think the two of us can thank my grandmother Eugenie Duhamel Picard for some of our independent spirit. For a woman of her time and despite bearing thirteen children, Eugenie left an imprint of her own “essence” on my mother, who in turn, left some with me. 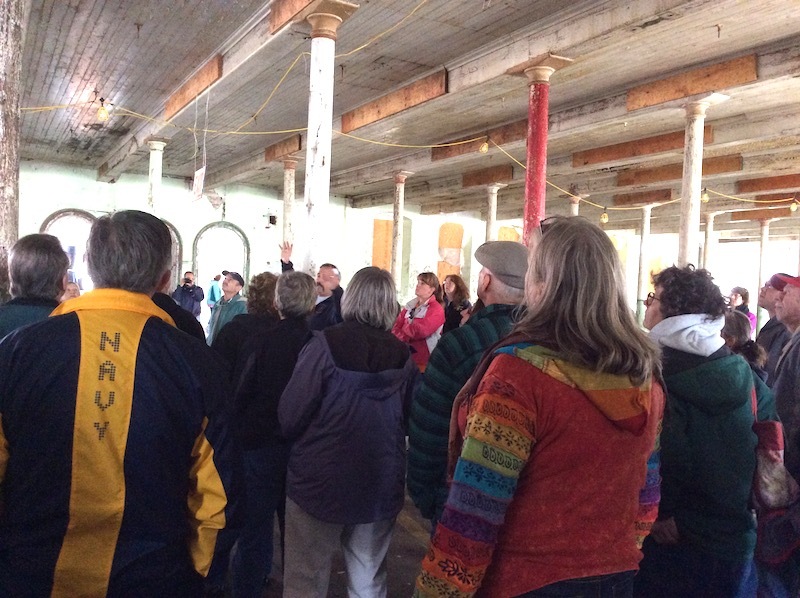 The WALKTOBER tour of Ponemah Mill helped me visualize the space where my mother created all sorts of cloth — from blankets to coffin linings, and parachute material to a fine gossamer fabric that lined the wings of airplanes. Walking in my mother’s footsteps illuminated me. For most of her life and mine, I didn’t understand what an “expert” weaver she was, how valued an employee she was, and how she thrived in her job. I’m glad I know this now. As a weaver, I took particular interest in this article … stunned by the size of the floor where the looms resided! And I love the anecdote where Bernice’s mother tied the tiny bobbin thread knot that passed through the eye of the sewing machine needle. Anyone who has worked on a sewing machine should be astonished. Touching lovely story, and I loved all the photos. I feel as though I was right there … on that nostalgic wonderful tour. Thanks so much for your comment, Bella. 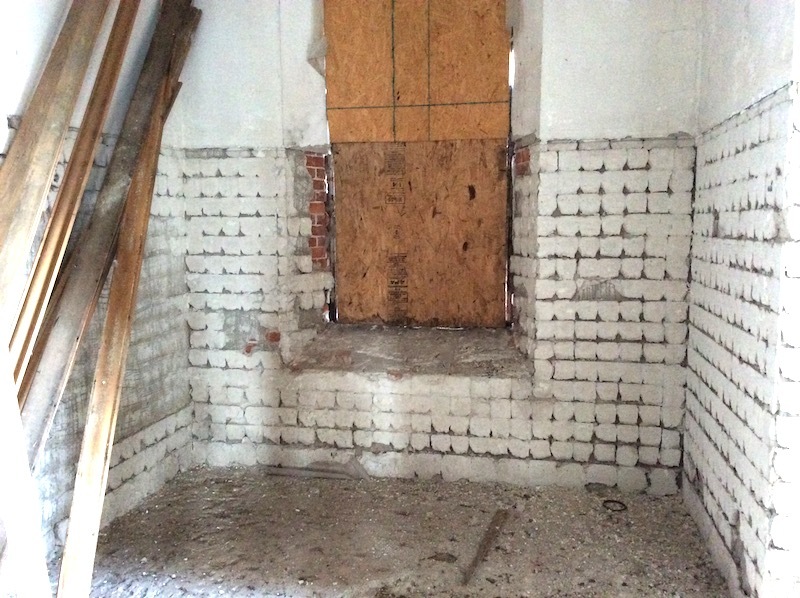 Yes, the floors were immense, and the photo showed the larger portion, but there was another 30-40 percent of the total floor space in the opposite direction! My writing group reviewed this draft this past week and the tiny knot episode seemed a highlight. Love to “hear” you write. I thoroughly enjoyed reading about your family in such a loving memorial. The history of the mill intrigued me. Thanks for sharing. Thank you so much for your comments. This was a “hearing” the looms sort of creation. I was a fortunate child, but could have been more perceptive in my younger years. 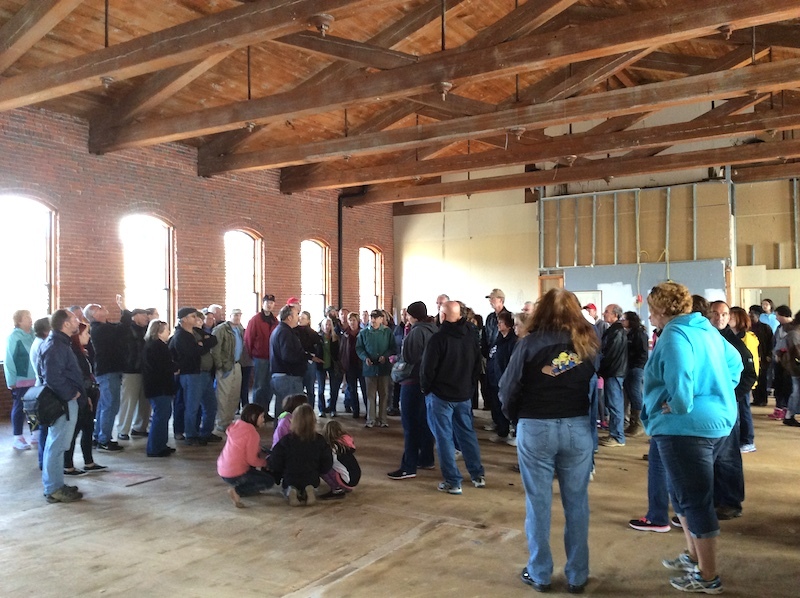 Glad to learn the mill tour was of interest. So hoped I could successfully “weave” a story from three time periods.